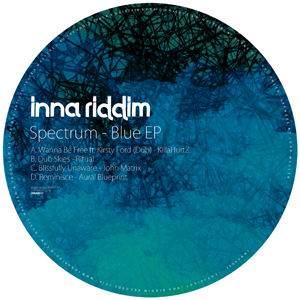 After five years of releases drawn from the full palette of bass music by artists from across the globe, we’re in reflective mood, so it’s apt that the first installment of Spectrum, our re-release series, is the Blue EP, a carefully curated selection of the more emotive and soulful tracks from our catalogue, crossing genres and styles in pursuit of a vibe. KillaHurtZ sets the tone of the EP with the first track, ‘Wanna Be Free’ – expansive melodies layered over a snapping 2-step in a spacious, lush arrangement beautifully augmented by guest vocalist Kirsty Ford’s sultry vocals. ‘Dub Skies’ by Ritual ups the tempo but retains the vibe, coasting forward on warm, expansive synths and a rolling drum&bass breakbeat: timeless, an instant classic. John Matrix conjures a serene yet elegiac melancholy on ‘Blissfully Unaware’, letting angelic filter-suffused vocal samples drift through complex percussion. The EP closes out with ‘Reminisce’ by Aural Blueprint, all cool jazz and warm rushes for the recovery session: deep rhodes, muted pads and emotive flute.